Vroon BV announced today that they have signed newbuilding contracts for four pure car and truck carriers (PCTC) of 3,900 unit capacity. In anticipation of growing demand, Netherlands shipping firm orders from Mitsubishi. The vessels will be built in a Mitsubishi shipyard in Japan, the company said, and are scheduled for delivery between summer 2009 and spring 2010. 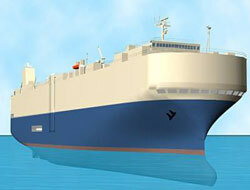 Vroon say they anticipate a further demand for car carriers in the years to come, in particular for medium-size vessels. Service speed will be approximately 19.9 knots.